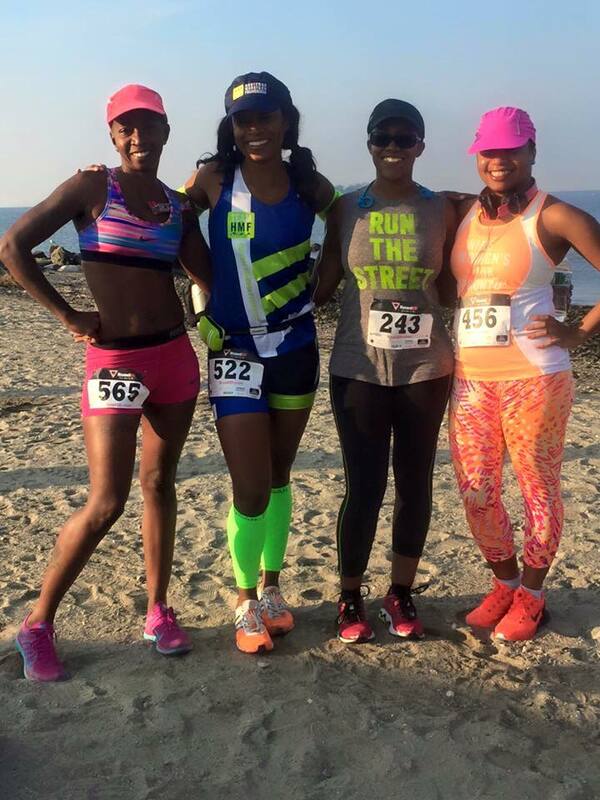 On Saturday, September 20 I ran my 11th half marathon of the year, the Gulf Beach Half Marathon in Milford, CT. This was was only about 45 minutes from my house so I figured it would be a great half marathon to add to my schedule. The communication for the race could not have been better. The race director was constantly providing updates on their Facebook page and sending emails weeks leading up to the race. Some smaller races do not have this communication so it was great to see that everything was already very organized. I woke up at 5:30am with a charlie horse in my calf muscle – not the most ideal way to wake up! Even though I felt not so great, I did my normal morning race day rituals, grabbed my honey stinger waffle and left the house. The race was scheduled to start at 8:00am so I arrived by 7:00am to make sure I had enough time to pick up my bib and prepare for the race. 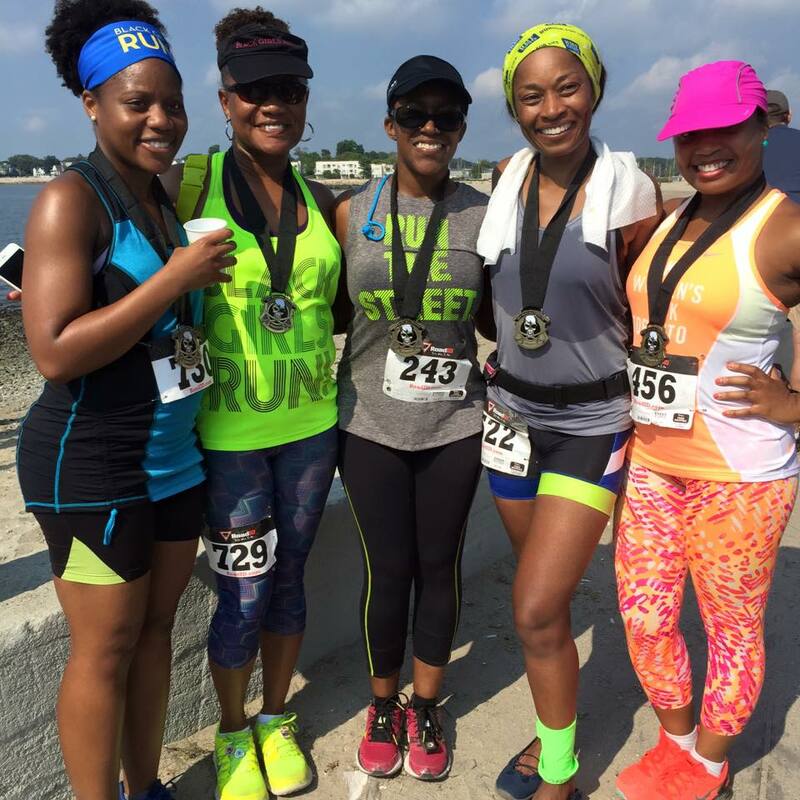 Bib pick up was easy-peasy and I ran into my friend Lisa and a few other ladies from Black Girls Run in Connecticut. 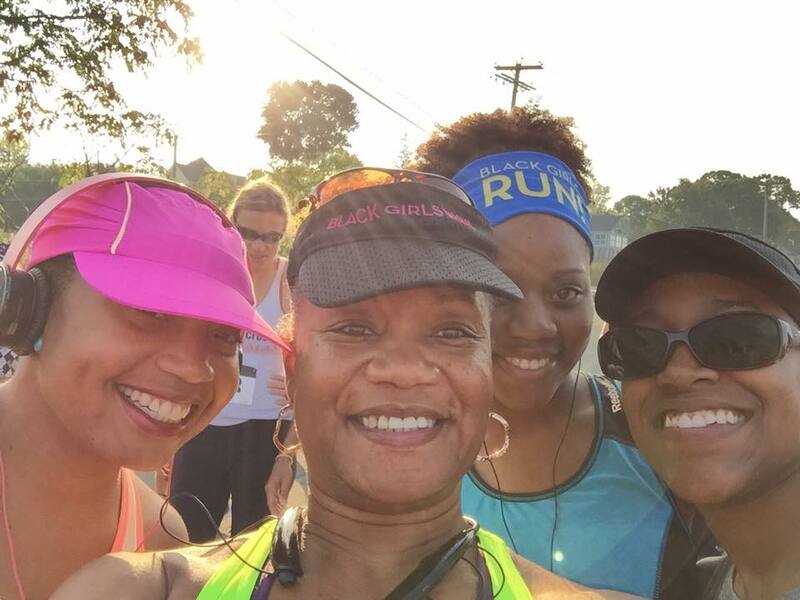 While Lisa and I were waiting to start, we ran into two other members from BGR in Maryland – hey ladies! Then we were off to start the race! The race started out well for me. I was actually on pace for a PR until mile 4 and that my friends is when the sh*t hit the fan. Once we hit the boardwalk part of the run I just started to feel really bad. I got a side stitch that ended up staying with me until the end of the race. I started to feel really nauseous (the smell of ocean water wasn’t sitting well with me) and my legs literally felt like lead. My brain was saying move and my legs just were not getting that signal. I had to stop and walk. I knew once I had to stop at mile 4 that I was completely screwed. By mile 6 my left arm went numb and starting tingling for about 5 minutes. That scared me so I actually just stopped running and walking and took some deep breaths and then continued on. The rest of the run was utterly craptastic and I did a walk/run until I finished. I can honestly say that I have never felt that awful during a run. I think that I may have been dehydrated as I’m not sure what else could have happened. At the end of the race I didn’t even wear my medal because I was so pissed off and discouraged. Finally I put it on for a photo but that’s it. Some days you have it, and some days you don’t. This was definitely one day when I did NOT have it! Water Stations – There were plenty of water stations along the course (I believe 6 in total). I didn’t have to stop for water since I had my Nathan handheld with me, but there were plenty of volunteers to hand out water and Gatorade. They also had volunteers handing out GU along the course which I thought was great (even though I don’t use GU). Most races only have GU available at one station but this race had it available at multiple locations. Community Support – Since this race goes through Milford, many residents came out to cheer us on. It was really heart-warming to get high-fives from children and cheers and thumbs up from adults. Sometimes that support is really needed and I needed it a whole bunch! Goody Bag/Race Shirt – This is the first race goody bag I have received where I will actually use everything. Also the race tech shirt is sleeveless! Bathrooms – Luckily I didn’t have to use the bathroom but I didn’t see any lines, which is always a good thing. 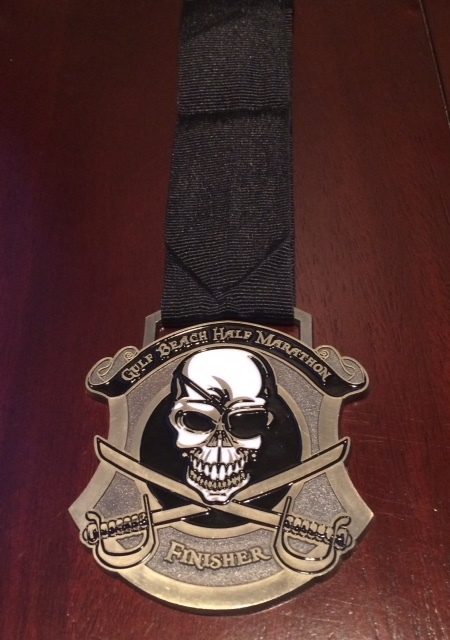 Medal – You know I’m all about the “bling-bling” and this medal didn’t disappoint. It’s very fitting that the medal is a scull because I felt like death during and after the race. Course – The race course was okay but there were certain areas where someone could/should have been directing traffic. I didn’t feel comfortable running on a two-way traffic road with cars to my back. Most drivers were nice but some were assholes. Finish Line – Okay. I know the beach is great and all, but finishing a race on the sand is just evil. Granted it was only the .1 of the race that was on the sand, but it was brutal. I was so worried about twisting my ankle. I can barely run on solid ground so running on sand was not for me lol. Post-Race Food – This is just a personal preference since I prefer bagels and fruit at the finish. This race offered Subway sandwiches, chips and a cookie after the race. I’m not a huge fan of deli meat, but I did like that they had a somewhat healthy option available. I’m thankfully feeling much better now but I really hope that whatever happened out there was a fluke. I have a double race weekend coming up (5K and 10 miler) and I really don’t want a repeat of what happened during the race! In unrelated news, I’ve entered this contest from Bibs2Bags. They asked us to upload a photo of our favorite bib and explain why. I chose my bib from my very first half marathon because 1. It was my first half marathon! and 2. It’s a cool bib with an image of an NYC bridge in the background. I’d appreciate any votes! Have you ever had a bad race? How did you get over it? Oh my friend! I hate races that feel like that but the good news is you are done with #11 and that tank is truly BADASS! Oh and I voted…of course! Thanks Smitha! I've nver had a race that bad in my life but thank god its over and now I just have to look forward to the rest of my Fall races! Oh, I"ve had a few bad races, but my most memorable was my first Chicago marathon. What a disaster that was for me! Luckily, I finally got up the courage to do it again, and redeemed myself last year. Idk, tho. Finishing is winning, and you finished! "Finishing is winning" – I love that! 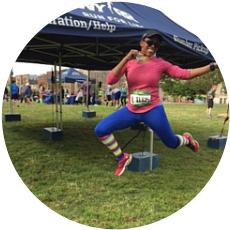 Kudos to you for going back to Chicago and conquering the course!